Episode #231: Laughter is the best medicine. On this episode, I chat with Agathe Tupula Kabola, speech language pathologist and author who lives in Montréal, about her use of humour in therapy sessions. 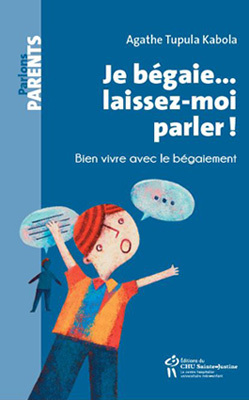 Agathe recently published her third book, Je bégaie… laissez-moi parler ! Bien vivre avec le bégaiement (which roughly translates to I stutter… let me speak. Living well with stuttering. ), containing all the information readers need to know about stuttering, therapy, and, well, living well with stuttering! Agathe and I talk about how humour provides an excellent way to engage clients – especially children – as laughter can empower people who stutter, ease tension, and bring people together. We also talk about how developing a sense of humour towards one’s own stuttering can also be a great method towards easing the frustrations of stuttering and spreading awareness.